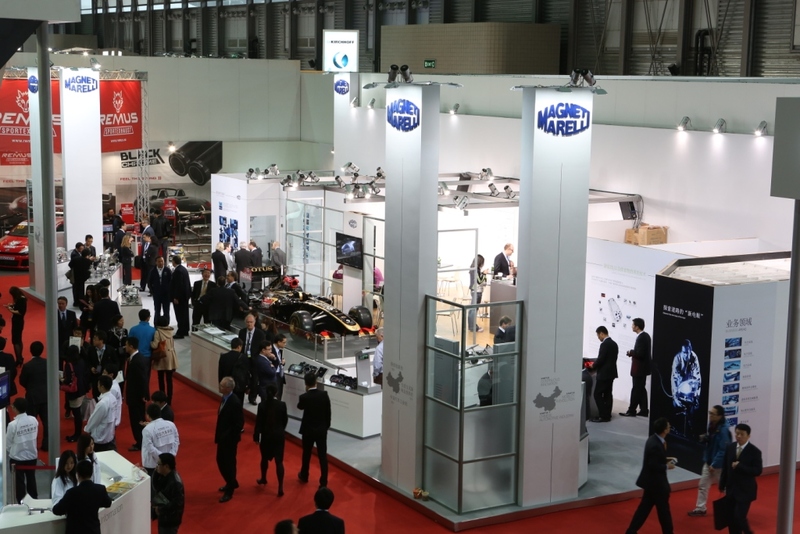 The Shanghai Auto Trade Fair, from 21st to 29th of April, is the ideal occasion to promote another excellent year for Magneti Marelli in China: turnover in 2012 reached 287.4 million Euros, a decisive increase compared to the 240.7 million Euros recorded in 2011 (232 million in 2010). This is an increase of over 19% in the last year, with performance that exceeds even the growth of the Chinese auto market – the largest in the world – which nevertheless grew by 6% in 2012 in terms of cars produced (from 17.27 to 18.23 million – source IHS data March 2013). Despite being a significant result, it remains part of a continuing trend that has seen Magneti Marelli increase from 44 million Euros in turnover in 2005 to 287 in 2012, with a 31% average annual growth rate. Again, this rate is superior to the average annual growth of the auto market in China, which increased from 5.2 million vehicles produced in 2005 to 18.2 million in 2012, an average annual increase of 21% (source IHS data March 2013). Magneti Marelli, which has had a presence in the country since 1996, is therefore establishing a very solid base in China: with a footprint that covers the main strategic areas of the Chinese automobile industry (Shanghai, Jiading, Guangzhou, Wuhu, Hangzhou, Changchun, Changsha and Hefei), the company serves 13 Chinese carmakers and 10 international carmakers present in China, relying on 8 industrial sites – including direct presence and Joint Ventures – which currently employ over 3000 people, of which 370 handle R&D. Future prospects indicate the possibility of a significant, constant increase in business volume, both in the medium and long term, considering three key factors such as the relentless development of the ‘local’ automotive market in a country inhabited by billions of people, the growing importance of China as a global player on the automotive market and the consequent need for increased technological content. According to IHS, in 2025 China will reach a total of about 34 million vehicles produced, partly to satisfy local demand and partly to assume a role as global player in the automotive sector, with an important presence on foreign markets. In order to be competitive on these markets and simultaneously tackle the problem of CO2 and sustainable mobility in the country, the technological content of Chinese vehicles must necessarily increase both in quantitative and qualitative terms, as well as in decisive areas such as safety, consumption/emissions and connectivity. This is the setting in which Magneti Marelli, on the basis of a consolidated industrial presence and existing technology, united with medium term strategies aimed at expansion and development of both these factors, can hope to accompany the numerical and technological growth of the Chinese market. Based on this trend of constant growth, it is possible that turnover will double in just two/three years, potentially achieving the symbolic level of a billion Euros turnover in four/five years (in 2016, again according to IHS, China will produce 26.3 million vehicles). From a technological perspective in particular, Magneti Marelli boasts strengths that will support and add value to such growth, mainly the direct injection systems and hybrid-electricity engine technology, as well as telemetry and infotainment technology which enable connection of the car to information and service networks. Alongside these, basic products such as shock absorbers and exhaust systems, with technical evolution that has focused respectively on the development of ‘intelligent’ shock absorbers and ‘sound design’ technology that can determine the ‘sound’ of car in a captivating way. In a large part of these areas, Magneti Marelli benefits from know-how and methods derived from the world of racing and the largest world Motorsports championships, which nowadays, driven by the growing need to reduce costs, consumption and emission, make ‘technological transfer’ from the track to the world of ‘road cars increasingly strategic and possible. In this sense, Motorsports, which the company has been involved in since its establishment in 1919, is for Magneti Marelli a tech lab and incubator for the development of new skills and technologies that feed and inspire new ‘green’ solutions in the field of ‘sustainable mobility’, especially Powertrain (hybrids and GDI) and Infotainment (broadband data transmission between vehicles and between vehicles and infrastructure). Another fundamental area of technology that will drive growth on the Chinese market is car lighting, Magneti Marelli’s top business sector at a global level and technological point of excellence, especially with regard to LED and Xenon solutions. Lighting plays a fundamental role in safety; it is also relevant in terms of reducing consumption and emissions and has a decisive impact on the aesthetic of a car, thanks to new design possibilities provided by new technology. In the lighting sector, Magneti Marelli is also expanding its aftermarket activity to China, in terms of original, top quality spare parts. Joint Venture between Magneti Marelli and Shanghai Automobile Gear Works (SAGW) for the production of components for the Freechoice AMT (Automatic Manual Transmission). The JV was signed in January 2009 and production began in June 2010. Production is located in Jiading, on the outskirts of Shanghai, with volumes reaching 60,000 units per year. The workforce stands at approximately 200 people. Magneti Marelli and Wanxiang Qianchao Company signed an equal Joint Venture in August 2011, for the production of parts for shock absorbers in Hangzhou, capital of the Zhejiang province. Activity began in January 2012 and production was up to over 7500 units/day by April 2013 with a workforce of over 300 people. The Joint Venture between Magneti Marelli and Changchun Fudi Equipment Technology Development (Fudi) signed in early 2012, sees a 51% Magneti Marelli shareholding. Production of throttled bodies and intake manifolds began in March 2013, in Changchun, North East China. When fully operative, annual production is 1.3 million throttle bodies and a million intake manifolds with a workforce of over 200 people. Hefei Magneti Marelli Exhaust Systems Co. Ltd. In 2012, a Joint Venture was signed between Magneti Marelli, Hefei Jianghuai Automotive Co., Ltd (JAC) and Hefei Lingdatang Collective Assets Management Co., Ltd (Lingdatang). Magneti Marelli holds a 51% shareholding, JAC 37% and Lingdatant 12%. The JV handles research, development, design, production and sale of exhaust systems for engines, including intake manifolds, exhaust pipes, catalytic converters and silencers. Production began in March 2013 and the plant is located in the Taohua Industry Park in the city of Hefei in the Anhui province. When fully operational, the workforce is approximately 130 people. Magneti Marelli will be in Hall N4, Stand B040 at the Shanghai Auto Fair. The exhibition theme sees the Magneti Marelli motto “A part of…” interpreted in three key messages: “A part of Mobility R-Evolution”, meaning constant commitment to research into sustainable mobility solutions; “A part of Continuous Innovation”, constant and continuous approach to innovation; and finally “A part of Chinese Automotive Industry”, firm commitment to contributing to the growth of the Chinese Automotive Industry. In centre stage on the stand is the Lotus E21, star of this early Formula 1 season, which use various technologies and systems by Magneti Marelli Motorsport (KERS, coils, alternators and injectors). This presence testifies to Magneti Marelli’s know-how and excellence in Motorsports: field of reference, inspiration and application of evolved technologies, in constant connection with mass production. Various examples of this exchange are displayed at the stand, with particular focus on the future: the GDI direct injection from racing series, hybrid engine systems based on ERS technology (Energy Recovery System that includes K-ERS and H-ERS) and the possible transfer of know-how between advanced telemetry solutions for racing and the info-telematics technology for communication between mass produced vehicles and infrastructure. Furthermore, the data logger used by all the sport tourism vehicles in the CTCC championship (China Touring Car Championship) is on display. Within the stand, Magneti Marelli has devoted a large area to Lighting technology, setting up a ‘dark room’ for visitors where they can try out a nocturnal drive with the different technology available in terms of power and range of the beam, thanks to four different types of light: halogen, xenon 25 watt, xenon 35 watt and LED. In addition, the ‘dark room’ also contains different design solutions for DRL (Daylight Running Light), so as to demonstrate the Company’s ability to satisfy carmakers in terms of style and technological integration with vehicle aesthetics. The full-LED adaptive lights from the Audi A7, an innovative LED Tail lamp prototype and an LED beacon are also on display. In the Powertrain sphere, Magneti Marelli presents its contribution to the HY-KERS system that will be used on the new LaFerrari, the first hybrid vehicle by Maranello. The electric part developed with Magneti Marelli consists of two electric motors (one principal and one for auxiliary systems) for maximum power of 120 kW (163 HP) and various strategic parts for electronics management and control. GDI systems (Gasoline Direct Injection) composed of injectors, pump and electronic control unit and software are also on display. GDI technology, which was initially used in series production, has already been applied in the Motorsports field too and in 2014 will also be used in Formula 1. Magneti Marelli is testing injectors and pumps for motors with petrol pressure up to 500 bars for this racing application. The Electronic Systems area is present at Auto Shanghai with three multimedia totems that demonstrate the technical characteristics of Magneti Marelli multimedia systems. Among these: the Touchscreen used by Peugeot, the one chosen by Paccar for a truck environment and a demonstration of the power of the telematics box. The Touchscreen in particular is a modular device for reproducing music and photos; the most advanced version allows internet connection via a USB stick. Once connected to the vehicle CAN network, it represents a diagnostic HMI interface that makes it possible to see vehicle and navigation information through a 7” high-resolution touchscreen (800x480 pixels). The telematics box totem illustrates how, by integrating a wireless connection into communication networks, satellite localisation and an accelerometer, this device can enable on-board use of intelligent mobility management services. The stand also presents the first infotainment solution with Genivi compliant software in automotive Linux hardware. A series of technologies dedicated to cluster instruments and display are also exhibited to represent Magneti Marelli’s technological ability and development in this sector and highlight the different possibilities for customisation and the scope of this range, which extends from basic models to more evolved dashboards. Among these, the instrument cluster used for the Qoros 3 produced in the Magneti Marelli plant in Guangzhou and the innovative E-Tron Amoled, a display inserted into the rear-view mirror within the car, which is activated when reversing, allowing the driver to see the area behind the car thanks to a camera positioned there. The stand also displays technology such as Shock Absorbers, Exhaust Systems, Plastic & Modules, with pedals and components, and Aftermarket, which will be officially launched in China in 2013 as the Magneti Marelli After Market Parts & Services business area, with initial production of Magneti Marelli batteries for the local Chinese market. Some important models that will preview at Auto Shanghai feature Magneti Marelli technology. Among these, the international preview of the new Maserati Ghibli, for which Magneti Marelli provided an Xenon illumination system with AFX (Advanced Frontlight Extended), instrument cluster, GDI pump for 3.0 V6 gasoline engine, shock absorbers and hands free module system. The Asian debut for the Maserati Quattroporte, equipped with instrument cluster, LED lights, GDI pump for 3.0 V6 and 3.8 V8 gasoline engines and hands-free module system produced by Magneti Marelli. A large amount of Magneti Marelli technology is used on vehicles by Chinese Carmakers, including the new brand Qoros. An instrument cluster was produced in the Magneti Marelli plant in Guangzhou, China, to equip the Qoros 3. Furthermore, worldwide previews such as the Chery A2 Sedan (electronic motor control system and throttled body), GAC Triumpchi GA3 (transmission control unit…), JAC YueYue FL and JAC Heyue S30 (Freechoice AMT complete with electronic control system, hydraulic kit and exhaust systems), BAIC E-Series HB (throttled body), and JAC Refine S5 (exhaust systems). For the Audi Q5 intended for the Chinese market, in addition to the LED lights, Magneti Marelli also provides the instrument cluster, again made in plants in China. In the lighting sector, Magneti Marelli technology is used on LED lights on the Buick Regal GS and Ford Mondeo and projectors on the BMW X4 and Citroën C4L Sedan. The Fair will also see the Chinese presentation of the Jeep Grand Cherokee equipped with Magneti Marelli LED lights and the Renault Fluence with halogen and xenon lights and projectors. Powertrain applications are used on many previews. A throttled body on the Skoda New Octavia, Skoda Rapid (this also uses GDI system injectors – Gasoline Direct Injection) and the Citroën New Elysee (also with shock absorbers). Intake manifolds and shock absorbers on the Citroen C4L Sedan and GM Cruze HB. Throttled body and intake manifolds on the Volkswagen Lavida HB and Sagitar GLI. The latter also features Magneti Marelli GDI system injectors.